CHEEKI THIRSTY MAX 1600 ml 1.6 litre TEAL Stainless Steel Water Bottle with Bamboo and Stainless Steel Lid Best place for stainless steel water bottles and insulated water bottles. Buy reusable water bottles. 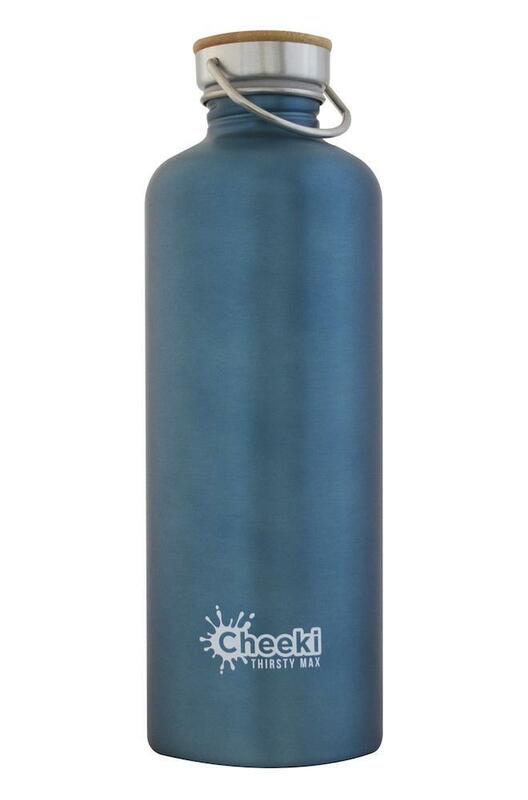 Cheeki Thirsty Max 1600 ml 1.6 Litre TEAL Stainless Steel Water Bottle Come with Bamboo and Stainless Steel Lid. Cheeki - 1600 ml 1,6 Litre Thirsty Max Teal - Stainless Steel Water Bottle with Bamboo Top Screw on Stainless Steel Loop - All Stainless Interior. This fresh new popular Australian brand has a good choice of sizes and designs. No nasty toxins to leach into your drinking water; pure stainless steel inside with BPA-free lids. Notice how the water tastes fresh and clear! Non-toxic inks used on artwork exteriors. Cheeki Bottles are manufactured from Premium 18/8 304 Food Grade Stainless Steel. Aim to encourage a huge reduction in the consumption of disposable plastic water bottles. Just fill your Cheeki bottle and leave it in the fridge overnight, next day out you go to work, school or play with cool fresh water! Cool Fresh Water – chill your Cheeki Bottle in the fridge overnight for nice cool water. Great for work, school, or day tripping out and about. Make your Cheeki bottles a way of life! Cheeki are continuously adding to their fabulous eye catching designs and now have new designs out for summer. Cheeki bottles are guaranteed for one year from the time of purchase against faulty workmanship or materials. We Do not recommend freezing your Cheeki Bottles! Safe, Healthy, BPA-Free – No nasty toxins to leach into your drinking water; pure stainless steel inside with Stainless Steel Lid..
Water tastes fresh and clean! Does not retain or impart flavours. Lid has a Bamboo Top and is All Stainless on Interior of Lid. Cheeki Bottles are manufactured from Premium 18/8 304 Food Grade Stainless Steel. Water sweet is an online water bottles shop. Buy stainless steel water bottles including klean kanteen stainless steel water bottles and bpa free water bottles.